Jinbocho is famous for being Tokyo’s book district. From literature to art books, comics to books on subculture, magazines and books from all around the world are crowded into this busy district. Yet, while the area is overflowing with old bookshops, sometimes you can catch the fragrance of curry floating by on the air. 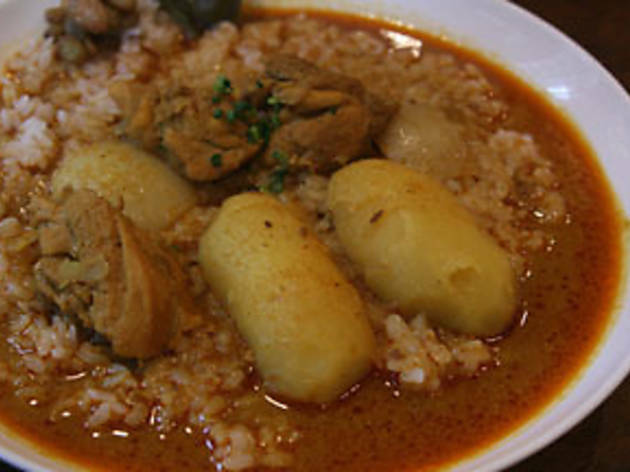 In fact, Jinbocho is also known for its fiercely competitive curry scene. If you leave the station from exit A5 and head down Yasukuni-dori in the direction of Kanda, you’ll hit one of its finest representatives: Kama. Despite all the neighbouring competition, this well-loved Indian restaurant has even die-hard curry fans singing its praises. 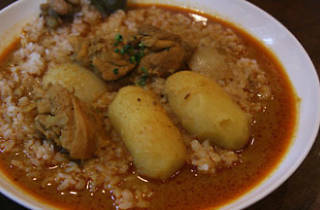 Kama’s special is its chicken curry. Containing two whole potatoes and generous portions of chunky chicken, it's made with a smooth roux that perfectly complements the rice. To make the soup stock, chicken bones and beef tendons are stewed for around two hours along with vegetables like cabbage, onions, carrots and ginger. The richness of the meat is tempered by the gentle flavour of the vegetables, and the finished product has a transparency unhindered by its spices. The addition of fruits like apples and mangoes also gives the dish a hint of sweetness. Nevertheless, with a single taste, what you’ll realise is that it’s a pretty spicy dish. But even with all the heat, it’s irresistible. One key is that the potatoes are cut into large blocks so their sweetness can match the spiciness of the roux.